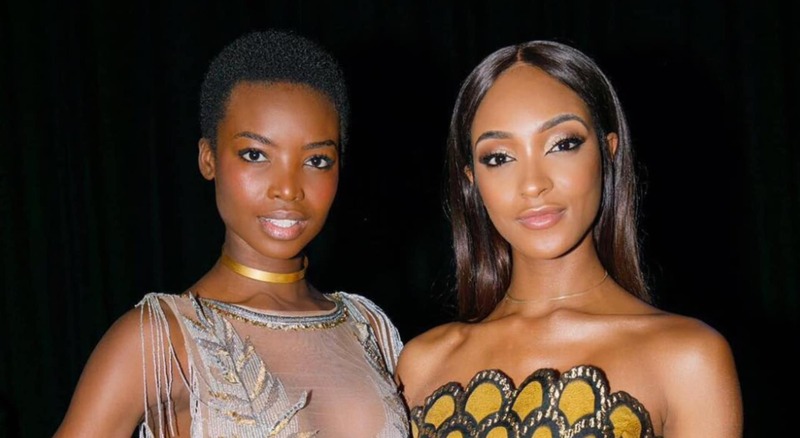 September 22, 2017 - In what was a memorable evening at the amfAR (The Foundation for AIDS Research) Gala during Milan Fashion Week, Supermodel Maria Borges Stunned the audience adorning a Menē 24 Karat Gold Choker and the Menē Stacking Cuff. Borges, seen above with fellow Victoria Secret Supermodel Jourdan Dunn, was chosen by InStyle Magazine as second best dressed for the evening. Maria Borges is an Angolan fashion model. She was named Forbes Africa Magazine's top model of 2013. She is a Riccardo Tisci favorite and calls him her " godfather ". Maria Borges made history on 10 November 2015 by being the first black model to ever walk in the [Victoria's Secret](Victoria's Secret) fashion show whilst wearing her natural afro hair . In 2012, she signed with Supreme Agency. One month later, she debuted her first Fashion week where she walked 17 runways. For her second season, she was a Givenchy exclusive. Borges has appeared in editorials for French, Italian, British, Spanish, German, and Portuguese Vogue, German and Australian Harper's Bazaar, Brazilian Marie Claire, French Numèro, V, W, i-D, and Interview . In 2017, Maria Borges was the first African woman to feature on the cover of the American version of ELLE, 20 years after Sudanese model Alek Wek in 1997. American Foundation for Aids Research (amfAR) is an international nonprofit organization dedicated to the support of AIDS research, HIV prevention, treatment education, and the advocacy of AIDS-related public policy.